Given the electricity sector accounts for around one-third of national emissions, it must be asked why the government is only seeking to achieve 5% of the required abatement from the NEM. On Friday, the COAG Energy Council received further advice from the Energy Security Board (ESB) in relation to the so-called National Energy Guarantee (NEG), and gave their approval for further work to be done, and a final design completed by August. The NEG includes both reliability and emissions obligations that will be imposed on retailers. Most of the political focus and public discussion, since the release of the NEG as a concept in October last year, has centred on the reliability obligation. This is in large part because of the rather misguided view that the power system is in crisis with blackouts to be the new norm unless active intervention is undertaken to bring forward investment in so-called dispatchable generation, or to retain existing dispatchable generation beyond planned closure dates (e.g. Liddell power station which is scheduled to be closed in 2022). There is no identified shortfall in capacity over the coming decade even with the closure of Liddell and AEMO’s own analysis supports this view. Given that the NEG reliability obligation is designed only to be triggered in the event of an identified shortfall of dispatchable capacity, then this measure is likely to result in nothing more than administrative overhead for the industry and consumers will bear an additional, unnecessary cost. Of much greater interest to industry is the emissions obligation, the second leg of the NEG. The emissions obligation seeks to impose a constraint on electricity retailers so that the emissions intensity of their supply does not exceed a specified benchmark. This level is to be set by Government, independent of the NEG mechanism. The electricity market modelling that was undertaken for the ESB utilised an emissions budget of 1,352 Mt CO2 for the NEM over the period 2020-21 to 2029-30, the period covering the Paris Agreement. This represents a very small reduction over doing nothing as the Business as Usual (BAU) scenario modelled had emissions of around 1,396 Mt CO2 over the same period. Therefore, the NEG is only seeking to achieve abatement of around 44 Mt CO2-e over a 10-year period. Reviewing the Department of Environment and Energy’s latest emission projections report reveals that the cumulative abatement target for Australia for the period 2020-21 to 2029-30 is assessed to be 868 Mt CO2 (down from 990 Mt CO2 in 2016) to meet a 26 per cent reduction on 2005 levels by 2030. Given that the electricity sector accounts for around one-third of national emissions, it must be asked why the government is only seeking to achieve 5 per cent of the required abatement from the National Electricity Market. If the ESB modelling is in accord with current government policy, it appears that the government is walking away from undertaking any meaningful abatement in electricity in the post-2020 period. If this is the case, it will burden the other sectors of the economy to do the heavy lifting. Achieving abatement in some of these other sectors is extremely challenging and potentially very expensive. The key reason for the discrepancy in the calculation of abatement targets is that most appear to misunderstand what a commitment to a 26 percent reduction by 2030 means in practice. While the Paris commitments to emissions reductions are generally specified as a target by 2030, this target will be translated into a carbon budget for Australia for the decade, in the same way our Kyoto commitments were previously translated. This is generally done through the development of a notional linear emissions trajectory, with our budget for the decade set as the area under this trajectory. The final target is relatively unambiguous as this is how our commitment has been framed. A 26 percent reduction on 2005 emissions (597 Mt) gives a 2030 emissions target of 442 Mt. However, the starting point for this emissions trajectory is where the water gets muddied. In simple terms, the higher the starting point, the larger the area under the trajectory (the carbon budget), the less aggregate emissions reduction and the easier it is to achieve. At a national level, the Department of the Environment and Energy present the 2030 abatement task as being a linear trajectory starting at the end of the Kyoto trajectory in 2020 (marked by the intersection of the dotted lines in Figure 1.1 below). This is what gives rise to the estimated 868 Mt of additional abatement required to meet the obligation. However, a different approach appears to have been used in sectoral modelling for the Government or Government-sponsored activities, including the Finkel review and the NEG modelling undertaken for the ESB. In those cases, the starting point of the linear trajectory for the electricity sector commenced in 2020 at projected NEM emissions in 2020. As electricity sector emissions have already reduced significantly since 2005, this approach means very little remaining abatement would need to be achieved in the electricity sector post-2020 period. This is reflected in the ESB NEG modelling only seeking 44 Mt of abatement over 10 years. This implies that the remaining 842 Mt of abatement will need to be achieved from sectors other than electricity. Over the last decade, it has become apparent the electricity sector will lead decarbonisation efforts in our and other economies as new low emissions technologies have become available and the cost of deploying them has fallen markedly. Therefore, a more sensible approach in determining an emissions budget by sector is, at a minimum, to pro-rate the remaining abatement task between 2020-21 and 2029-30 among each sector, based on its proportionate contribution to emissions under the Baseline Scenario. This is shown in the table below based on emissions from the Department of Environment and Energy’s 2017 projections. Total Australian Baseline emissions are projected to be 5,648 Mt CO2 over the period 2020-21 to 2029-30. Given a stated abatement task of 868 Mt CO2 to meet a 26% reduction, this implies an Australian budget of 4,780 Mt CO2. The electricity sector accounts for 31% of the projected emissions over this period, so it seems sensible to require it to achieve 31% of the abatement (i.e. 268 Mt CO2) at a minimum. Given that the NEM accounts for an estimated 82% of electricity emissions, it is also reasonable to assign it a pro-rata share of the 268 Mt CO2, although it should be noted that abatement from non-NEM grids may be more difficult to achieve. This approach provides an abatement target of 220 Mt CO2 for the NEM. This is five times the abatement task the government and ESB have been using in recent modelling and undermines any conclusions drawn from those exercises. An emissions budget for the NEM of 1,352 Mt CO2 is far too generous and puts too much reliance on other sectors which will likely increase the aggregate cost of meeting our 26% target. The NEM budget should be revised down to around 1,214 Mt CO2 for the emissions obligation of the NEG to make a proportionate contribution. This approach is the absolute minimum abatement task which should be applied to the NEM as it is likely to be lower cost abatement than other sectors. 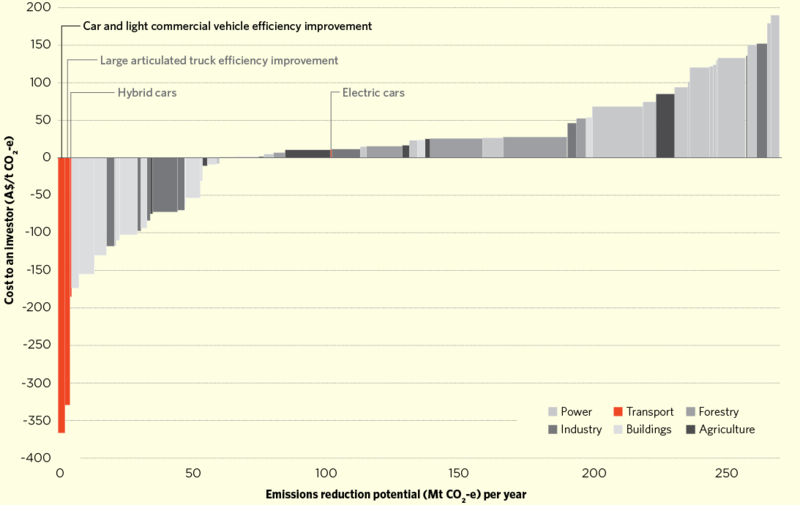 Decarbonisation of electricity is likely to be a precursor for decarbonisation of other sectors, especially transport where the shift to electric vehicles to reduce transport emissions requires electrical energy from low to zero emissions sources. Owen Kelp is a Principal at ACIL Allen Consulting. He has previously undertaken electricity sector emission projections for the Department of the Environment and Energy and commonly undertakes electricity market projections for governments and market participants. Thank you, Owen. This is a really interesting analysis which demonstrates once again that the devil is in the detail. I have long thought that many climate change deniers are cowards, and it seems that this climate change denying government is also a coward. They seem to be afraid to face up to the reality of the climate emergency we face, and they certainly are not facing up to the need to reduce emissions across the whole economy in the most cost-effective way possible. Even blind Freddy should be able to see that in the short term the bulk of the reductions must come from the electricity sector. What is the government so afraid of? Conservatives (and their voters) are overall fearful of everything. It is hard wired into their brain. The thing is, even those of us who are hardwired to be overly fearful (and I’m one of them!) are not necessarily political conservatives. In order to be a political conservative, you also have to be *stupid* and *self-deluding*. To be a political conservative, you have to be led around by the nose like a very stupid sheep, being afraid of what a bunch of crooks point you at, instead of being afraid of what’s really scary. Because those of us who are intelligent and honest with ourselves are afraid of… global warming. And are willing to do what it takes to stop this terrible risk. And then I remember the epidemic of childhood lead poisoning caused by leaded gasoline (see the work of Rick Nevin). Golly gee — it turns out the age brackets with the most right-wing voters are the ones with the most childhood lead poisoning. The correlation works in multiple countries. So it’s not their fault — the majority of right-wing voters are actually brain-damaged, by childhood lead poisoning, and that’s why they’re so dumb. You make a very good point as to why they aren’t afraid of AGW. Maybe the fear of change or new information over rides it. The lead argument doesn’t really explain the split 50/50 Conservative vs Progressive voter in most Western democracies. I think the destruction of the public education system is partly to blame. And in the stupidity quadrant there are plenty of conservative bandits leading the truly stupid. Note that ClimateWorks Australia did an analysis in 2010 that mapped CO2 emissions reductions by sector against the cost of obtaining those reductions. On the left side of the graph the least-cost CO2 emission reductions were achieved at a saving, not a cost to the economy. The first ‘cab off the rank’ was “car and light commercial vehicle fleet efficiency improvement”. 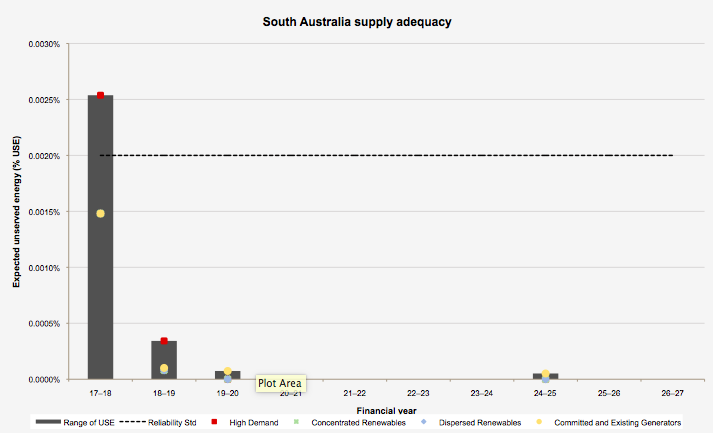 Which AEMO report says, “no shortfall in capacity”? The statement of opportunities says there is no shortfall in QLD or TAS, but identifies significant increased risk of load shedding in NSW after the Liddell closure in 2022. 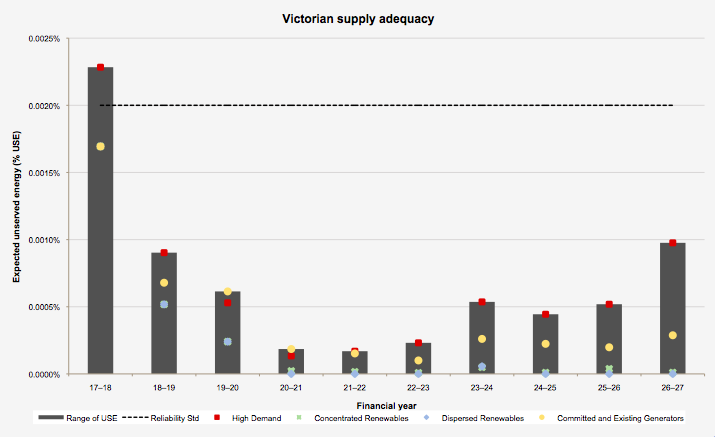 The same report identifies the highest risk of load shedding in 2017/18 in SA and VIC because the reliability standard “will not be met” without additional “firming capability”. Yep, that’s why they secured the demand management to act as a reserve. And 2017/18 is now passed, and there were no supply shortfalls. Thanks, I’ve seen those, and the modelling scenarios seem sound, but it’s difficult to reconcile the increased LOR notices with “increased reliability”. Perhaps I should have used the term “security”. There are a range of rule changes in the works, especially around minimum levels of inertia or batteries, market changes for inertia services, system security, and the ongoing reviews of frequency control and reliability by the AEMC. Their words not mine, and I think that is a reasonable assessment of the situation. Draft frequency control frameworks review – AEMC. Perhaps you could write an article on this process and highlight the concerns and actions of the rule maker? I’m guessing we’ve probably written about 100, maybe 200 articles on these issues in recent years. Yes, the change from a reliance on slow moving synchronous machines to inverter based technologies with fast-acting batteries and demand management requires changes to managing the system, just like change from analogue to digital. But it doesn’t mean the lights are going out. It should also be axiomatic that going from a few centralised generators to literally millions of decentralised generators should have made the regulator twig well before this that the design of the market might need more than a tweak! But as we are seeing at the Bank RC, the conservative line is to drag their feet as long as possible in the face of the inevitable, and then claim it would’ve been worse to be proactive or even expeditious!